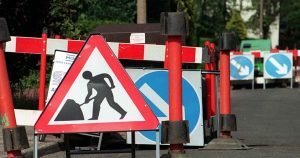 Give and take traffic control signals for emergency repair to two burst water mains by Thames Water, including resurfacing the roads. Work is estimated to be finished by the end of the week. Give and take traffic control signals for 2 patching’s of concrete. Work being organised by Wokingham Borough Council. Multi-way traffic control signalling for a piping ferrule exchange by Thames Water. Give and take traffic control signals to patch up a footway. Work being organised by Wokingham Borough Council. Give and take traffic control signalling to patch up a footway. Work being organised by Wokingham Borough Council. Some carriageway incursion to allow the installation of a new lighting column. Work organised by Wokingham Borough Council. Some carriageway incursion to allow a bus shelter to moved. Excavation and trenches are planned by Scottish and Southern Power Distribution. Give and take traffic control signalling to allow the patching of a footway by Wokingham Borough Council. Possible carriageway incursion to allow Thames Water to rectify a dangerous rain defect. Possible carriageway incursion to allow Openrach to expand their service to a new customer. Give and take traffic control to allow Wokingham Borough Council to reinstate a footway. Give and take traffic control signalling to allow Wokingham Borough Council to patch up a footway.